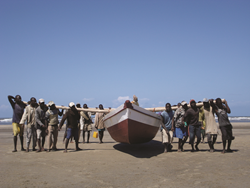 Local fishers carrying their fishing boat onto the shore in Mozambique. This week, the international conservation organization, Rare, adds Mozambique to its list of partnering countries participating in its Fish Forever program, an initiative for small-scale fisheries management worldwide. This launch aims to move the country toward sustainable fishing practices that both preserve the country’s incredible ecosystem biodiversity, and allow for more sustainable fisheries. In partnership with the Nordic Development Fund, the World Bank, the National Institute for the Development of Fisheries and Aquaculture (IDEPA), and Mozambique’s Ministry of the Sea, Inland Waters and Fisheries, the launch of Rare’s Fish Forever program in Mozambique signifies its 5th country globally and first African nation to partner on transforming both the local and national approach to small-scale fisheries management. “Our direct partnership with IDEPA and the Ministry of Fisheries reflects our shared commitment to empower and equip local communities with the necessary tools to manage their fisheries more sustainably,” said Patrick Mehlman, Rare’s Vice President of Mozambique Programs, noting that this tandem effort will “further strengthen the framework for success” in future efforts to establish a national model for fisheries management along the country’s vibrant coast. The launch of this partnership also addresses formidable global concerns around food security, livelihood sustainability and climate change mitigation. For many in Mozambique, fishing serves as an essential source of food and income. Nearly half a million people nationwide rely on small-scale fishing for employment, and small-scale fishers account for more than 85 percent of the country’s annual catch. Like many other countries in the developing tropics, Mozambique’s reliance on small scale fishing is threatened by overfishing, which is in turn depleting fishers’ food security, income and way of life. Rare’s Fish Forever approach and partnership with IDEPA will work to turn the tide by establishing long-lasting solutions deeply embedded in government policy and community practice. Rare’s proven success in Belize is just one example of how pre-existing government partnerships can provide a successful and rapid transition to complete in-country ownership. With IDEPA staff playing a critical role in bringing the program to scale, there exists an even greater potential to create long-lasting change in fisheries management that allows both people and nature to thrive. IDEPA staff will participate in a two-year long training program, ultimately providing them the tools to train and empower local fishing communities to sustainably manage their fisheries. Rare is an innovative conservation organization that implements proven conservation solutions and trains local leaders in communities worldwide. Through its signature Pride campaigns, Rare inspires people to take pride in the species and habitats that make their community unique, while also introducing practical alternatives to environmentally destructive practices. Employees of local governments or non-profit organizations receive extensive training on fisheries management, campaign planning and social marketing to communities. They are equipped to deliver community-based solutions based on natural and social science, while leveraging policy and market forces to accelerate change through programs such as Fish Forever. To learn more about Rare, please visit http://www.rare.org/. For more information and downloadable imagery, please visit our electronic press kit at https://www.rare.org/en-press-kit.